He’s the difficult child. The one who makes me look like a bad parent. He doesn’t listen. I have to repeat myself a million times. He doesn’t come when called. He runs out into the street. He doesn’t play well with others. He spits out his medicine. He’s stubborn. When he’s done, he’s done. He digs his heels into the ground and I have to drag him away, tail between my legs, wondering where I’ve gone wrong. He’s the dog. Until now, I’ve had it pretty good as a parent. My kids threw fits here and there, sure. A couple of bad ones in public. But I never felt like the parent everyone always scrutinized. Now, when I can even get this four-legged kid to go for a walk, pet parents look at me with disapproval when he misbehaves. “Katy wants to play,” a woman beams as her panting dog bounds toward us. Great. I’m trying to keep Rowan from barking or growling. “I’m not sure he’s interested,” I say and try to steer my unsure dog off the sidewalk. He doesn’t like big dogs. And there’s the look. At me. Like my kid just spat in her kid’s face. Let’s be honest. We’re out here to poop and move on, lady. Your giant, fluffy poodle is freaking my tiny terrier out. And me a little too if you want to know the truth. We’ve had our dog, Rowan, for about ten months. He’s an anxious dog. We don’t know what kind of life he had before he came to live with us. We rescued him from a temporary home of more than 20 dogs. He was a stray before that. To be honest, some days we can maybe see why he became a stray. He’s made progress, slowly. He’s kind of the weird kid. He rolls in dead worms on the sidewalk. He’s the clingy kid who follows his daddy or me around every second. He doesn’t want to play with his kind. He’s been a challenge. He channels Houdini, escaping his locked metal crate, bending the bars, losing a tooth in the process. He ate some blinds, a scone, lots of tissues, some holes in our bedspreads, probably some Legos, and he used to pant and shake when he knew we were leaving. The vet, a trainer, they both gave advice. Nothing seemed to help except what we felt in our gut. We had to medicate, quit using the crate when we left the house—every experience has been another story to tell. I never consulted “experts” with the kids. I didn’t even read parenting books. But one day I found myself taking Rowan to doggie day care so he could socialize with other dogs. And as I left, I held my breath that I wouldn’t get any phone calls to come back, that he would pass and be allowed to return. He did. We watched him on a webcam as he ran from door to door that day, ignoring the other dogs and lifting his leg freely. Even now, we still see him misbehave on the webcam, doing the exact things he hates for other dogs to do to him. As many times as we’ve threatened to get rid of him, Rowan has worked his way into our hearts—some more slowly than others. He makes us laugh at his speedy bursts of energy around the room. He makes us realize that we all come with insecurities and quirks and that none of us are perfect. And he’s challenged us to love when it hasn’t been easy. It’s a good thing he’s cute. Growing up, I knew no other team than the Redskins. In fact, for a long time I thought they must play the Blueskins, the Grayskins, the Greenskins. I heard a lot of words I shouldn’t have heard and I learned to stay away from the den on Sunday afternoons. There was always a lot of screaming and cheering and the beating of hands on my dad’s old recliner. If I had a favorite team, the Redskins was it. It was all I ever knew. My dad walked me down the aisle only because I didn’t marry a Cowboys fan. My husband-to-be rooted for the Eagles, a true born-and-bred fan from Philly who watched the team lose its only Super Bowl appearance at that point in 1981. When we had our son in North Carolina in 2003 and Eagles onesies started rolling in, I told my husband it was just possible our son could be a Panthers fan. I wanted to plant that seed early. I didn’t want him to get his hopes up. Through those early years, my son changed favorite teams as often as he changed his favorite color. He liked the Buccaneers, the Titans, the Jaguars, and the Vikings. He liked nearly every team but the Eagles. He’d get excited about football on Sunday afternoons. 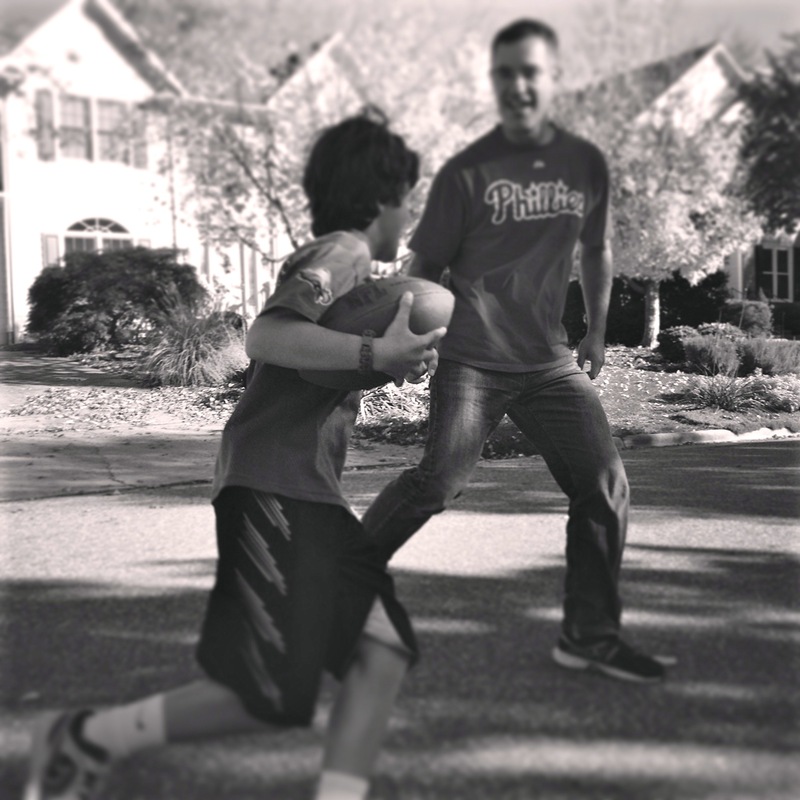 His dad put game gear on—the same shirt and socks with holes in each foot—and pumped up spirits with “E-A-G-L-E-S, EAGLES!” My son seemed excited about the prospect of watching football, watching TV. But ten minutes in, he climbed off the couch and found something else to do. More than anything, my husband just wanted my son to watch football with him. “Be careful what you wish for,” I told him. My husband told my son stories of staying up late watching Eagles football when he was a kid. He told him about crying when the Eagles lost the Super Bowl. He was in third grade at the time. He told him stories about the infamous crowd and how they were known for booing Santa one year. It wasn’t until around second grade that my son started to pay attention to football. Each year he’d watch the games a bit longer, snuggled into his dad’s arm. Every whistle blown, every flag thrown, my son asked why. Every player down, every player on the bench, my son asked why. Every player’s name, every player’s stats, my son wanted to know how was that spelled again and where is he from? How much does he weigh? What team did he play on before this one? I’d chuckle in the corner as my husband tried to watch the game and hear the commentators and refs. During every halftime, every commercial if he had it his way, my son grabbed a football and asked his dad to go outside. He had to play his own version of a game. The next morning, the first thing my son would ask was the score from the late game. In the car he’d ask me how to spell a player’s name or who I thought would make it to the playoffs. Did I know it was Ronnie Brown’s birthday? My husband had created a monster. Over time my son began to favor the Eagles, wearing the jersey his grandparents gave him to school every Monday after they played, talking trash with the other kids about their favorite teams. Now after school, I’m the fill-in for Dad. I can throw a pretty long spiral and it’s only taken two years to get there. My son is a pretty tough coach. He mentioned the other day that he dreamed the Eagles won the Super Bowl. He keeps up with their stats and thinks they have a good shot at the playoffs this year. Nick Foles is doing pretty well. He still watches every game on Sunday with his dad. He still asks a million questions. He still knows everyone’s name. Now he keeps an Eagles roster. And he still goes outside to throw the ball around with his dad during breaks. He wears his lucky Eagles jersey, shorts, socks, and underwear when they play. It’s been working, knock wood. My husband didn’t create a monster. He created a fan. And a bond.